The curse of natural resources, plus the curse of being Russia. They don’t even need a tax base. For most of the last decade, Igor Gladkoborodov worked his way up in Moscow’s vibrant high-tech scene, going from web developer to co-founder of an online-video startup that drew $3.5 million in local funding. Last month, he abandoned Moscow for Menlo Park, California, joining a growing flow of professionals leaving Russia amid recession, deepening international isolation and tightening regulation of the Internet. “Five years ago, there was still hope that things would change for the better,” says Gladkoborodov, 32, who moved with his wife and two young sons. 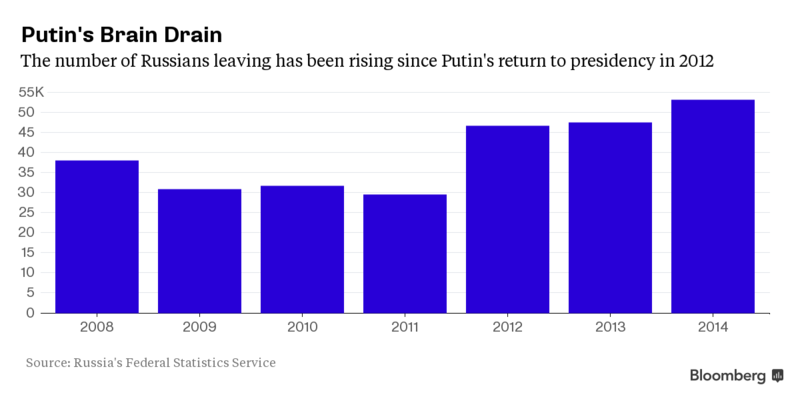 “Now it’s clear that Russia is facing a long systemic crisis,” he adds. In Silicon Valley, he says he regularly meets others from Moscow who’ve left. Official statistics show the number of Russian citizens leaving permanently or for more than nine months reached 53,235 in 2014, up 11 percent and the highest in nine years. Germany, the U.S. and Israel all report increases in the numbers of applications for immigration visas from Russia. This entry was posted in News & Views on October 20, 2015 by RomanInUkraine.